I have no time to do a proper blogpost tonight and no decent Internet access here in Branson. If you can believe it, even the one Starbucks store here has no wireless access. But I did find a computer repair shop in Branson West with a free wireless network, which they invite the public to access from their parking lot. It worked well enough for me to collect my e-mail. Hopefully it will allow me to send this quick blogpost. I've been listening toand catching televised glimpses ofthe news all day about the storm damage on the Gulf coast, and my heart is heavy about the enormous scope of the disaster and the catastrophic impact of so much human misery. I wanted to let all my brothers in the regionespecially Don Elbourne, Eddie Exposito, and Jerry Marcellinoknow that I am praying for them. Very early tomorrow morning, Darlene and I will get up and drive to Branson, Missouri. It's my absolute least favorite place in America: a shallow, artificial, entertainment-oriented culture that pretends to be rural but grinds to a halt every day with traffic jams that stretch for ten miles and manage to make big-city traffic seem like a drive in the country by comparison. Branson is the place where Jim Bakker went to start a new "ministry" after his release from prison. If he had come to any real American town and announced he was starting a TV ministry, he would have been tarred and feathered and ridden out on a rail. But I understand he has been quite successful in Branson. Show-biz style religion is very, very popular there. Not as popular as bad country music, perhaps, but still very popular. Did I mention that I really hate the place? Darlene's parents live there, however, and I really do love my in-laws. So almost every time we come to Tulsa, we make the long, tedious drive to Branson. Tomorrow we will make that annual pilgrimage. Then Thursday we'll return from Branson via Siloam Springs, where we'll have lunch with the inimitable Frank Turkhe of "Centuri0n" fame. So I have no time or energy to post anything of substance tonight. But as long as I'm here, and seeing that my past two posts have both been accompanied by comic-book art, why not continue the week's theme? I've always loved the look of comic-book cover art. 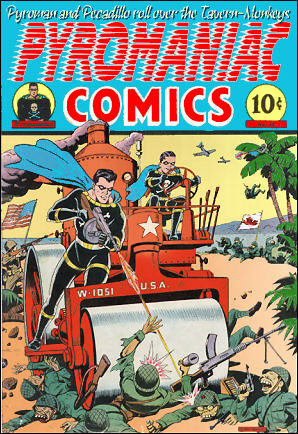 Just the image of a comic-book cover evokes vivid memories from my childhood of the unique smell of freshly-printed comic-book paper. Today's comic books don't ever smell that good. What's up with that? Anyway, this cover is in honor of my new sidekick, Pecadillo, whose blog has managed to upset more homeschool moms in a single week than I did in my first three months. My sincerest apologies to all whom he has managed to offend. Let me just say that he takes after his mother. My vacation officially began at 12:10 this afternoon. Darlene and I are flying to Tulsa first thing Monday morning. Unfortunately, I won't have time to post the usual "Monday Menagerie" entry before leaving for the airport. I do, however, have a great post in mind for tomorrow, and I expect to finish writing it on the plane, then post it either from the Dallas Airport, or from Tulsa soon after our arrival. Assuming the hurricane doesn't spin out weather that disrupts our travel, we ought to be in Tulsa by mid-afternoon tomorrow. So keep watching this space. I don't expect the vacation will halt the continuity of the blog. I've had a hard time finding opportunities to blog this week. It's certainly not that there's nothing to blog about. But I've simply been too busy to write everything I'd like to say about all the scraps of this 'n' that which catch my attention during the course of a typical week. And this week was a lot more "typical" than mostwith C. J. Mahaney's visit to Grace Community Church, John MacArthur's appearance on "Larry King Live," Pat Robertson's Stage-One Plan for World Peace, and Karl Keating's use of John MacArthur as a foil for some rather blatant cheap shots. You might have expected me to comment on any or all of those events. I would have, if I had found the time. Steve Hays, in an article titled "Keating's Hissy Fit," exposes the fallacies in a recent propaganda piece Karl Keating sent to his constituents. I don't know how Steve Hays writes so much superb stuff, so well, so fast. Here I was, still pondering whether to categorize Keating's outburst as a hissy or a conniption, and Steve had already posted a full answer. Like Steve Hays, James also underscored the laughable hypocrisy and utter irrationality of Keating's cynical attempt to caricature MacArthur as someone driven by self-conceit, while straight-facedly portraying Pope Ratzinger as the very model of self-deprecating humility. Tim Challies (see comment 4 in the linked thread) made a quick, funny, but quite accurate summary of Tuesday Night's discussion about "intelligent design" on "Larry King Live." Tim managed to capture many aspects of the tone and atmospherethings the actual "Larry King Live" transcript can't record very well. One other vital thing you'll miss if you did not see the actual broadcast is Deepak Chopra's body language toward MacArthur. Though he is ostensibly a very sharp new-age guru whose message is all about tolerance and harmony, Deepak simply cannot manage to communicate anything other than sheer animosity toward John MacArthur personally, as well as utter contempt for everything John stands for. Each time the two of them have appeared together on Larry King, Deepak has become progressively more rude and condescending. At times, it is downright funny, such as the episode where Deepak insisted the New Testament was originally written in Aramaic rather than Koine Greek. The Great, All-Knowing Guru became extremely exasperated that MacArthur would not simply take his word for it. This time, Deepak interrupted or spoke over the top of MacArthur virtually every time MacArthur opened his mouth. I was glad for our pastor's Christlike meekness and good manners. I'll confess that as I watched, I kept thinking how difficult it would be for me to restrain myself from wanting to "accidentally" roll my chair over the toes of this pompous, self-styled swami. Speaking of less-than-sanctified responses to wicked people, Frank Turk perfectly captured my thoughts about the dangers posed by Christian leaders like Pat Robertson, who apparently think "belligerence" is the operative part of the expression "co-belligerence." Al Mohler also graciously but boldly called for Robertson to repent and retract. Ligon Duncan, who always seems to know just what to say, blogged about C. J. Mahaney's ministry at Grace Community Church. "God Loves You and Has a Wonderful Frisbee for Your Life," by Eric Zeller at "Foolishblog." "At Least Her Skin Was Thin" (a post about the lady who filed a complaint against her doctor for telling her she was too fat), by Jared Wilson at "The Thinklings." Disclaimer: Technorati has become wll-nigh useless, and even The Truth Laid Bear seems to be seriously crippled lately, (completely losing track of some 300+ links to PyroManiac in the past three days alone). So it's not easy to ferret out who is linking to the blog nowadays. 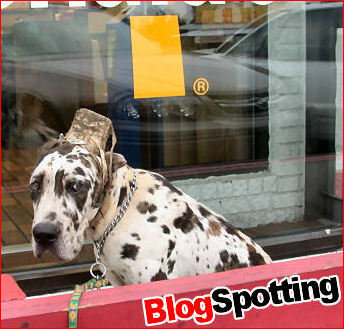 If I have missed anyone who desperately hoped to get BlogSpotted, I'm sorry. But time is short, the hour is late, I'm really tired, my dial-up connection is slow, and all the standard search-engine tools are working against me. Sal at "Stand Up and Walk" finds another spiritual analogy in the Rubik's Cube. Some anonymous guy at "Miscreant" finds high irony in my recommendation of Carl Trueman's book, and he is convinced Trueman's essay exposing the maladroit handling of historical theology by New Perspectivists is "unsupportable"though he admits he hasn't actually read Trueman's book. John Schroeder intimidates me with his knowledge of math. Bill Hayes liked the Rubik's Cube post. Kevin at "Kevin Carey Music" seems shocked that I am not in step with the postmodern party line on new-model theology and labels. He reminds us that labels can be misused. Then, as if to give an object lesson, he misspells my last name throughout his article. I still say the fact that people often misuse labels and misspell surnames is no valid argument against the correct use of name tags. In fact, I would point out that judicious and proper use of labels can go a long way toward correcting the bad thinking and wrong ideas that result from careless mislabeling. Julian at "Christian Thought" is pleased that I noticed the Canadian blogging hordes. It does sometimes seem that half the bloggers who link here are Canadians. But, then, what else is there to do in Canada without hockey? Daniel J. Phillips remarks on the significance of young Charles Spurgeon's "slow roasting" under the convicting ministry of the Holy Spirit. Joel at "Life Under the Son" liked the penguin smackdown video almost as much as I did. Bret Capranica shares my pain when his computer goes downthough he seems to boast that he drinks more manly coffee than I do (hah! ), and he points out that I should not be snide about what anyone else's picture looks like (point taken). Doug Wilson can't imagine what possible connection anyone might see between postmodernism and the friends of the Auburn Avenue Theology. Doug characterizes the movement as nothing more than an "affirmation of an objective covenant." It seems to me that Peter Leithart's assessment of the Auburn movement is a lot more candid. And notice where "an objective covenant" has got the cast and crew at Communio Sanctorum. Tim Enloe's frequent disclaimers about the uselessness of the term postmodern notwithstanding, many of the arguments Enloe and friends regularly employ are borrowed straight from the pomo playbook. 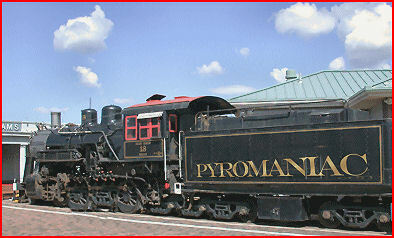 Pastor Ray Pritchard has some nice things to say about PyroManiac. John Rabe lures me to his blog so that he can diss the Cubs. However, I personally think his "throw-stuff-at-Rita-Cosby post" was both brilliant and wickedly funny. Jeremy Moore is a happy man. Samuel Smith loved John MacArthur's discourse on spoonerisms. Ebenezer is surprised to find himself knee-deep in controversy. That's all I have time for at the moment. I have a very full weekend, and I'm leaving for Tulsa Monday morning. I'll post again when I can, but no promises about when that will be. My pastor, John MacArthur, whom I have never seen truly flummoxed in any situation where he was called upon to speak, discusses an affliction that frequently bedevils the rest of us. No preacher likes the feeling of being tongue-tiedespecially when it happens in the pulpit. Those awkward moments when your brain gets stuck in neutral and your mouth continues to rev are the nightmare of every preacher. It can be especially dangerous when everything you say is recorded. A few years ago some of the guys who work on our radio broadcast put together a taped collection of all my verbal fumbles over the years. They collected about fifteen years' worth of out-takes and strung them together to make an entire sermon of nonsense. It was a painful thing to listen to. So I have nothing but extreme pity for the Reverend William Archibald Spooner, who suffered from a disability that no preacher deserves. 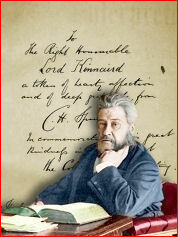 Spooner was a brilliant man who was dean of New College, Oxford, at the turn of the century. Today he is chiefly remembered because he elevated slips of the tongue to an art form. He was particularly prone to one variety of verbal blunder that has been given his name: the spoonerism. A spoonerism is when you transpose syllables or sounds from two or more words, resulting in nonsenseas in "Let me sew you to your sheet." Spooner's backward eloquence was unsurpassed. Reprimanding a wayward student, he allegedly uttered these immortal words:"You have hissed all my mystery lectures; I saw you fight a liar on the college grounds; in fact, you have tasted the whole worm!" Once Spooner accidentally referred to the stately Queen Victoria as "our queer old dean." It's easy to see how this tendency could adversely affect a preaching ministry. Spooner's tendency to transpose sounds occasionally caused him to say the very opposite of what he intended. Once when the Reverend was performing a wedding, he told the bridegroom, "It is kisstomary to cuss the bride." On another occasion Spooner was preaching on Psalm 23, and he assured his congregation that "Our Lord is a shoving leopard." When you realize that Spooner's ministry was primarily among students, you have to give him high marks for fortitude. No communicator wants to mangle the message. But for Christian communicators the need to get the message right is elevated to the height of a sacred duty. Perhaps we can smile and pardon an affliction like William Spooner's, but we certainly cannot tolerate any distortion of divine truth that results from traits such as sloppy thinking, laziness, carelessness, apathy, or indifference. More sinister yet is the tendency to sidestep elements of truth or water down the message because of a desire to please people, a love of worldly praise, or a lack of holy courage. If anything, the obligation to communicate the truth of the gospel clearly and accurately weighs more heavily on our generation than on those who have gone before us, because our opportunities are so much greater. Luke 12:48 says, "From everyone who has been given much shall much be required." No previous generation has been blessed with the means of mass communication like ours. A hundred years ago "Christian communication" consisted almost totally of preaching sermons and writing books. The only form of mass communication was the press. It never occurred to men like Charles Spurgeon that the means would exist to transmit live sound and images via satellite to every nation in the world. Spurgeon was the most listened-to preacher in history by the end of the nineteenth century. He preached to huge crowds in his church. By some estimates, four million people actually heard him preach in person over a remarkable lifetime of ministry. But today, via radio, Chuck Swindoll preaches to more people than that in a typical week. 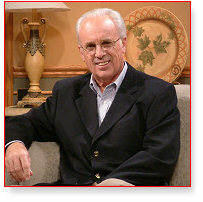 J. Vernon McGee ("he being dead yet speaketh") has been broadcasting every weekday worldwide for decades. If you count the sermons that are translated and preached in other languages, McGee has undoubtedly preached to more people than any other person in history, and he continues to do so from the grave. The staff who produce our recordings like to remind me that the sun never sets on our ministry. At any given moment of the day or night, worldwide and around the clock, someone, somewhere is listening to a sermon I preached from our church pulpit. I can't tell you how heavily that responsibility continually weighs on me. I am constantly aware of the obligation to get the message right, to speak it clearly, and to proclaim it with authority and conviction. New vistas in communications are constantly opening up. At Grace to You we now offer a daily podcast of the radio broadcast. No longer is it necessary to order a cassette tape and wait for delivery. Sermons can now be downloaded instantly from the website. Electronic media now make it possible for material to be searched and scrutinized like never before. Want to know what James Boice said about the doctrine of God? You can find it in an instant online. Wondering whether Spurgeon ever preached on the text of Scripture you're studying? Phil has a website that will answer that question for you in a minute. Satellite technology, digital sound, high-resolution wide-screen television, and blogs are all changing the way we process information. Other high-tech advances suggest that a hundred years from now, communications will have advanced at least as far beyond today's technology as our world has come since Spurgeon's time. If the Lord delays His return, our great-great grandchildren might have access to forms of communication that we cannot even imagine today. This is a very exciting age in which to live and minister. But let's remember Luke 12:48: "From everyone who has been given much shall much be required." We are stewards who will be held accountable for the opportunities the Lord has blessed us with. And if we are honest with ourselves, I think we would have to confess that the church for the most part has simply squandered the rich opportunities modern communication technology has given us. Our generation, with greater means than ever to reach the world with the gospel, is actually losing ground spiritually. The church's influence is apparently diminishing. Our message is becoming confused, and it is confusing. We are not speaking the truth plainly enough for the world to hear the message. We who have access to the divinely inspired truth of God's Word should be confronting the apathy and foolishness of a society that is addicted to entertainment and ignorant of truth. We should be shouting truth from the rooftops, not adapting our message to the shallow and insipid amusements that have left our society morally and intellectually bankrupt. Living in an age that has abandoned the quest for truth, the church cannot afford to be vacillating. We minister to people in desperate need of a word from the Lord, and we cannot soft-pedal our message or extenuate the gospel. If we make friends with the world, we set ourselves at enmity with God. If we trust worldly devices, we automatically relinquish the power of the Holy Spirit. By all means, let's make the most of the opportunities modern technology affords us. But in the midst of it all, remember that we ought to be less concerned with what is fashionable more concerned with what is true. Rather than adapting our message to suit the new media, let's utilize the media to present the unadulterated message as clearly, as accurately, and as fully as possible. If we're faithful in that, the soil God has prepared will bear fruit. His Word will not return void. People often ask me where to look for Spurgeon memorabiliaespecially letters and signatures from Spurgeon's own pen. Occasionally, eBay features quality Spurgeon collectables. At the moment, there's a rare opportunity to bid on a book personally inscribed from Spurgeon to Lord Kinnaird, a philanthropist who assisted in the support of the Pastors' College. The eBay listing bills the book as a "family Bible." The book is actually one of Spurgeon's own worksThe Interpreter. This was a family devotional book written by Spurgeon and consisting of selected Bible passages with devotional commentary (much like Morning and Evening). The Interpreter was the largest of all Spurgeon's books and was as large as a family Bible, with similar binding. The signature and inscription on this copy bear all the marks of authenticity. 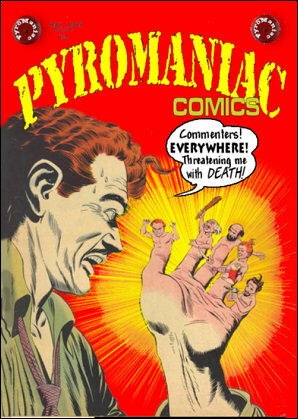 10:30 AM UPDATE: A shrewd collector who found the listing through PyroManiac this morning has already purchased the book. The rest of you may now go back to whatever you were doing. PS: Not that such statistics mean anything, but according to the BlogSpot counter, this is post #100 on PyroManiac. It is well known that Charles Spurgeon came to Christ when he ducked into a small church to escape a snowstorm and heard the gospel proclaimed. Some wrongly think Spurgeon was thus suddenly converted to Christ out of a life of sheer paganism. Spurgeon himself used to talk about how he had suffered for a long time under the weight of sin before he finally found Christ. Because of the way he described himself as a great sinner utterly in debt to divine grace, many who heard him preach came away with the impression that he was a man who had gone deeply into sin and come to Christ fairly late in life. But the facts are that Charles Spurgeon was converted to Christ while still in his youth, and he was the product of godly upbringing in a pastor's home. Spurgeon's two main role models, his father and his grandfather, both were godly pastors. Spurgeon was raised in his grandfather's home from his infancy until he was nearly six years old. Something, possibly economic difficulties, made it necessary for Charles to live with his paternal grandparents, in a village near the one where his parents lived, from the time he was nearly two years old until he was ready to start elementary school. Charles Spurgeon was his grandfather's constant companion, both in the pastor's study and when the elder Spurgeon made pastoral visits. Young Charles loved his grandfather's books. He was a prodigy when it came to reading, and he developed a love for books very early. He especially loved Pilgrim's Progress. By the time Spurgeon returned to his parents' home at age six, he already had three younger siblings, two sisters and a brother. He seemed already to feel very deeply his responsibility as the elder brother to influence them for good. That perspective, which was surely part of his grandfather's pastoral legacy, made him mature beyond his years. And this was a persistent trait of Charles Spurgeon's. As a young boy, even before he was a teenager, his hobbies were writing poetry and editing a magazine. Even then he was honing the literary skills that would make him legendary both as a preacher and an author. When Spurgeon was about 14, he and his brother James went to school in Maidstone, where Spurgeon's uncle was one of the teachers. It was there, as a very young teenager in a conversation with the school staff, that Charles was first exposed to the Baptist view on baptism. (Spurgeon's grandfather was a congregationalist who practiced infant baptism, and that was all that Spurgeon had ever known.) An Anglican school was an unlikely place for anyone with a congregational heritage to embrace Baptist beliefs. But Spurgeon, even at that young age, felt compelled to study the issue from Scripture and make up his own mind. As he did so, he found the Baptist position unassailable. So he made up his mind at age 14 that if he ever experienced conversion, he would be baptized. Such was the seriousness of his interest in spiritual things, even before his conversion. When Charles was about 10 or 11 years old, he began to be deeply convicted about his sin. He was convinced that he had no saving knowledge of Christ. So he set out on a quest for salvation that lasted about 5 years. This was an agonizing time of life for Spurgeon, because he already viewed spiritual matters with far more seriousness than any other boy his age. The knowledge that he himself was not a true Christian was something that weighed more heavily on him than language can express. It became a burden he carried around continually. Into those years was crowded a world of experience which enabled him in his subsequent ministry to probe the secrets of many hearts. He learned more of the things that matter in those years than most men learn in a lifetime. That one so young, so sheltered, trained from his babyhood in the ways of God, could have felt so much and have had such exercises of soul may seem impossible, his own account of his darkness and despair may appear exaggerated; but those who are versed in the ways of God will understand [Ibid., 23]. Spurgeon's own account of his struggle to find salvation does indeed leave us marveling that such a boy could feel his own sin so deeply. After all, he grew up in a godly family, in a pastor's home; he had never committed any sort of scandalous sin (probably the most serious sin he had ever fallen into was a lie); and yet the burden of his sin weighed so heavily on him that he was brought to the brink of utter despair by it. That, of course, was written by Spurgeon in his adult years, so it represents his mature way of describing how he felt as a child. But it is clear that even as an 11- or 12-year-old child, he was carrying around a sense of personal guilt that was unusually intense. The guilt was so profound that for 5 years it colored all his thinking. He never could get his thoughts completely away from the sense that he was a sinner, that he was guilty, and that he deserved hell. Spurgeon's mother was the one whose influence first awakened him to the claims of Christ on his life. Her exhortations to her children, as well as her prayers on their behalf, made an indelible impact on Charles as a young boy. Spurgeon's father played a somewhat lesser role in the children's spiritual instruction. He was a pastor and a godly man. He himself admitted that his wife more than he was responsible for the children's spiritual instruction. In fact, he used to recount an incident that occurred when he was on his way to some preaching engagement. (His ministry had an itinerant aspect that often took him out of the home.) On this particular occasion he became convicted that he was caring for other people and their spiritual needs, but neglecting his own family and his own children. He went back home. When he got home, upon entering the house quietly, he heard Mrs. Spurgeon in another room, praying for her children's conversion. John Spurgeon says he decided that his children's spiritual welfare was in good hands, and he returned to his preaching engagement. When the boy returned home from his grandfather's house, he greatly scandalised the congregation on Sunday by singing the last line of each verse twice. His father took him to task, but he said that his grandfather did it, and he would do it too. So his father told him that if he did it again he would give him a whipping that he would remember as long as he lived. Sunday came, and again the boy sang the last lines twice. It must have been amusing, for he had no singing voice. After the service his father asked him if he remembered what he had said. The boy remembered. Father and son then walked into the wood, passing a wheat field on the way, the father trying to win his son to repentance. There they kneeled and prayed together, and both were greatly moved. Turning back to the wheat field, the father plucked a stalk of wheat, and told Charles to hold out his hand. The wheat stalk was laid gently across it. "I told you I would give you a whipping you would never forget. You will never forget that," said his father. The gentle sternness of the punishment broke him down and won him over, and he never forgot it [Fullerton, 25-26]. Spurgeon's father, obviously, was a man who deeply loved Christ. His great compassion and tenderness left an indelible impression on young Charles's life. Spurgeon's father, his grandfather, and above all his mother, were therefore strong influences on him spiritually. On Sunday evenings, Mrs. Spurgeon would gather the children together around the table for Scripture reading and prayer. Spurgeon said she used to pray like this: "Now Lord, if my children go on in their sins, it will not be from ignorance that they perish. My soul must bear swift witness against them at the day of judgment if they lay not hold of Christ." Spurgeon said the thought of his own mother's bearing witness against him at the judgment seat of Christ pierced his conscience. Because of such influences, Charles began to develop a keen sense of his own guilt by the time he was 10 or 11. The thing that burdened him so much was a clear understanding that he was guilty in God's sight. He didn't have the limited perspective so many children havegrieving only because they have offended their parents. Spurgeon very seriously seemed to realize, even at a young age, that all his sins were an affront against God Himself. Spurgeon's unique perspective explains why he regarded himself as one of those "who were kept by God a long time before we found him" [Ibid.]. In his mind, those years of carrying the burden of his sin must have seemed like an eternity. Remember, he was brought up in a pastor's home in a godly environment from his infancy. He never seems to have succumbed to any sort of vile or gross behavior. He never engaged in any reputation-destroying sins. No scandalous sins appear anywhere in any account of in his life. He was converted at a fairly young age, 16. Yet he kept in his heart until the day he died a very strong sense that he was nothing but a horrible sinner. He never thought of himself as better than anyone. For the rest of his life he retained the fresh memory of that burden of guilt he had carried. And for that reason, he felt a close kinship to people converted to Christ after a long time in the depths of sin. I love that picture of dear old Christian [in Pilgrim's Progress]. I know, when I first read The Pilgrim's Progress, and saw in it the woodcut of Christian carrying the burden on his back, I felt so interested in the poor fellow, that I thought I should jump with joy when, after he had carried his heavy load so long, he at last got rid of it; and that was how I felt when the burden of guilt, which I had borne so long, was for ever rolled away from my shoulders and my heart [Ibid.]. During those years of conviction, Spurgeon was exposed to a lot of preaching about the law and guilt and sin, and all of this only intensified his woes. He records that some of the books that he read during this time included books like, Philip Doddridge's The Rise and Progress of Religion in the Soul, Richard Baxter's A Call to the Unconverted, Joseph Alllein's Alarm to Sinners, and John Angel James' book called The Anxious Inquirer. All of those books are written to convict over-confident people. Spurgeon said it was like sitting at the foot of Sinai. Fullerton adds this: "He read the Bible through, but found that its threatenings seemed to be printed in capitals and its promises in small type. With perverse ingenuity . . . he twisted everything to his own hurt, applying the cheering words to others and the woeful words to himself" [Fullerton, 27]. Day and night God's hand was heavy on me. If I slept a night I dreamed of the bottomless pit, and when I awoke I seemed to feel the misery I had dreamed. Up to God's house I went; my song was but a sigh. To my chamber I retired, and there, with tears and groans, I offered up my prayer without a hope and without a refuge, for God's law was flogging me with its ten-thonged whip and then rubbing me with brine afterwards, so that I did shake and quiver with pain and anguish [Ibid., 27]. In another place, Spurgeon likened all this preaching of the law to someone who was actually plowing the same ground over and over again, "with a team of ten black horses"the Ten Commandments. It must not be supposed that the lad became morbid during those years. He lived two lives, one keen, natural, bookish, observant; the other absorbed, fearful, doubting, insurgent. If he had spoken of his trouble, there were those round him who could, perhaps, have helped him out of it; but he battled alone, hiding his thoughts from them all, save once when he spoke to his grandfather of his fear of being a lost soul, and was somewhat comforted for a while. He would not believe because others believed; he must have an assurance of his own; he would not rest until he knew [Ibid., 26.]. Normally, people struggling with this sort of burden will talk to others and desperately reach out for comfort and assurance, and they want to feed off the verbal reassurances people invariably offer. The counselor's encouragement and comfort may last for a while, but because the issue isn't really settled in the sinner's own heart, he or she will go back to doubting. It can be very frustrating to counsel people with that perspective on their own sins. But Spurgeon knew better. He didn't feed off the assurance and encouragement that others could give him. He realized his business was with God, and he kept it between him and God. There's no doubt that it would have been good for Spurgeon to seek counsel from his grandparents, from his parents, or from other mature believers around him. They might have at least helped him bear the burden and certainly would have prayed diligently for him. But he didn't seek that kind of help. While under concern of soul, I resolved that I would attend all the places of worship in the town where I lived, in order that I might find out the way of salvation. I was willing to do anything, and be anything, if God would only forgive my sin. I set off, determined to go round to all the chapels, and I did go to every place of worship; but for a long time I went in vain. I do not, however, blame the ministers. One man preached Divine Sovereignty; I could hear him with pleasure, but what was that sublime truth to a poor sinner who wished to know what he must do to be saved? There was another admirable man who always preached about the law; but what was the use of ploughing up ground that needed to be sown? Another was a practical preacher. I heard him, but it was very much like a commanding officer teaching the manoeuvres of war to a set of men without feet. What could I do? All his exhortations were lost on me. I knew it, was said, "Believe on the Lord Jesus Christ, and thou shalt be saved;" but I did not know what it was to believe on Christ. These good men all preached truths suited to many in their congregations who were spiritually-minded people; but what I wanted to know was,"How can I get my sins forgiven? "and they never told me that. I desired to hear how a poor sinner, under a sense of sin, might find peace with God; and when I went, I heard a sermon on "Be not deceived, God is not mocked," which cut me up still worse; but did not bring me into rest. I went again, another day, and the text was something about the glories of the righteous; nothing for poor me! I was like a dog under the table, not allowed to eat of the children's food. I went time after time, and I can honestly say that I do not know that I ever went without prayer to God, and I am sure there was not a more attentive hearer than myself in all the place, for I panted and longed to understand how I might be saved [Spurgeon, 104-105]. Spurgeon's experience later helped shape his ministry. He remembered his frustration in wanting to hear the gospel but never hearing anything but law preached. That is why there is such a strong evangelistic thrust in almost every sermon Spurgeon ever preached. He almost never stood up in the pulpit without clearly giving the way of salvation and calling sinners to Christ. Ultimately, Spurgeon's conversion came through the most unlikely circumstances. One Sunday morning, while Spurgeon was in this phase of sampling various churches, a terrible snowstorm virtually shut down the little town of Colchester. Spurgeon was home from his boarding school for Christmas holidays. The date can be determined with absolute precision. It was Sunday, January 6, 1850. The snowstorm started early in the morning. Spurgeon had gotten up early in the morning because he had plans to go to a particular chapel on the other side of town. But just as Spurgeon began to make his way to church, the snowstorm grew worse. "LOOK UNTO ME, AND BE YE SAVED, ALL THE ENDS OF THE EARTH." He did not even pronounce the words rightly, but that did not matter. There was, I thought, a glimpse of hope for me in that text. The preacher began thus"My dear friends, this is a very simple text indeed. It says, 'Look.' Now lookin' don't take a deal of pains. It ain't liftin' your foot or your finger; it is just, 'Look.' Well, a man needn't go to College to learn to look. You may be the biggest fool, and yet you can look. A man needn't be worth a thousand a year to be able to look. Anyone can look; even a child can look. But then the text says, 'Look unto Me.' Ay!" said he, in broad Essex, "many on ye are lookin' to yourselves, but it's no use lookin' there. You'll never find any comfort in yourselves. Some look to God the Father. No, look to Him by-and-by. Jesus Christ says, 'Look unto Me.' Some on ye say, 'We must wait for the Spirit's workin'.' You have no business with that just now. Look to Christ. The text says, 'Look unto Me.'" Then the good man followed up his text in this way:"Look unto Me; I am sweatin' great drops of blood. Look unto Me; I am hangin' on the cross. Look unto Me; I am dead and buried. Look unto Me; I rise again. Look unto Me; I ascend to Heaven. Look unto Me; I am sittin' at the Father's right hand. O poor sinner, look unto Me! look unto Me! When he had gone to about that length, and managed to spin out ten minutes or so, he was at the end of his tether. Then he looked at me under the gallery, and I daresay, with so few present, he knew me to be a stranger. Just fixing his eyes on me, as if he knew all my heart, he said, "Young man, you look very miserable." Well, I did; but I had not been accustomed to have remarks made from the pulpit on my personal appearance before. However, it was a good blow, struck right home. He continued, "and you always will be miserablemiserable in life, and miserable in death,if you don't obey my text; but if you obey now, this moment, you will be saved." Then, lifting up his hands, he shouted, as only a Primitive Methodist could do, "Young man, look to Jesus Christ. Look! Look! Look! You have nothin' to do but to look and live." I saw at once the way of salvation. I know not what else he said,I did not take much notice of it,I was so possessed with that one thought. Like as when the brazen serpent was lifted up, the people only looked and were healed, so it was with me. I had been waiting to do fifty things, but when I heard that word, "Look!" what a charming word it seemed to me! Oh! I looked until I could almost have looked my eyes away. There and then the cloud was gone, the darkness had rolled away, and that moment I saw the sun; and I could have risen that instant, and sung with the most enthusiastic of them, of the precious blood of Christ, and the simple faith which looks alone to Him. Oh, that somebody had told me this before, "Trust Christ, and you shall be saved" [Spurgeon, 105-108.]. 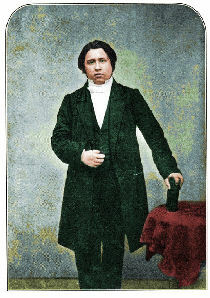 Spurgeon began preaching right after his conversion. He was converted in January, 1850. Amazingly, less than five years later he was called to be the pastor of the largest Baptist church in London. So within four years after his conversion, he preached his first sermon as the pastor in the pulpit of the congregation he would shepherd until the day he died. He never attended university or seminary. He seems to have sprung full grown into maturity as a pastor, preacher and a theologian. But the truth behind Spurgeon's remarkable ministry is that many of the influences that made him what he was were related to his earliest upbringing. They were the influences he gained from a godly home life, under the oversight of godly parents and grandparents. 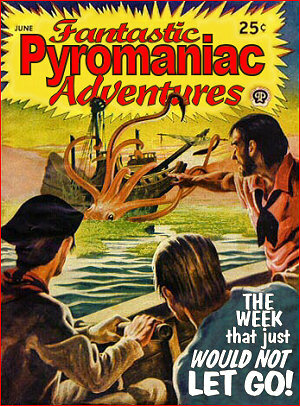 PyroManiac devotes Monday space to esoteric and offbeat things, in the hope that these will supply learning experiences for us all. It's never been my vision to make this blog a commentary on popular culture. I'm concerned primarily with biblical, theological, and church issues. Even on Mondays, when my own blogplan gives me lots of latitude to write about almost anything, you're not likely to find me commenting much on movies, television series, popular music, celebrities, professional sports (the Cubs don't really qualify here, do they? ), or any of the other standard icons of popular culture. Let me be clear: I don't have any problem with blogs that analyze or critique pop culture from a Christian perspective; I read and enjoy a few blogs that do it very well. But I'm neither a movie critic nor any kind of expert on the pop fashions of the current generation. Some readers may imagine that I'm opinionated about everythingas if I aspired to be an all-purpose critic. Not so. My public dogmatism is pretty much limited to subjects I have studied and love. If you want an argument about what is the best popular song of the past 40 years, I have absolutely no opinion whatsoever. I don't do top-ten movie lists or debates about which is the greatest episode of some syndicated TV series. I'm remarkably un-opinionated about such things. I couldn't even name five sitcoms that I ever watched faithfully. It's one of the ways I manage to stay focused on my work. However, today I'm going to break my own rule of thumb and recommend a movie. This may surprise you even more: It's not just a movie; it's a French film. It's a pretty artsy French motion picture that was nominated for an Academy Award® a few years ago. What's more, it's a movie I wouldn't recommend for youngsters. Shocked? Don't be. 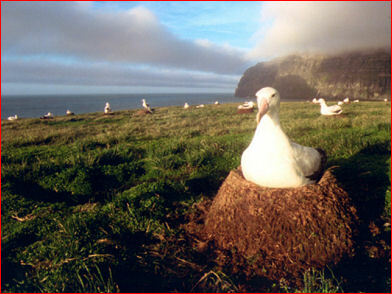 The film is "Le Peuple Migrateur," Jacques Perrin's 2001 documentary about migratory birds. It's also known by two English titles: "Winged Migration" and "Travelling Birds." Unless I missed something in the translation from French, there's absolutely nothing suggestive or morally inappropriate anywhere in the film. You can watch the whole thing without having your sanctification disturbed in the least. It's rated "G."
There's a hunting scene that might be disturbing to some children, and another sad and very graphic incident where an injured bird learns the meaning of the expression "food chain." But aside from those two scenes, I can't imagine anyone finding anything shocking or offensive in the film. In fact, the film graphically portrays the exquisite beauty and intricate wisdom of creation. It's a wonderful example of the truth of Romans 1:18-19. It ought to be clear to any rational person that the instincts and abilities that enable these birds to migrate with such accuracy in every conceivable climate did not "evolve" by accident. I saw this film last week on that bus trip I took. We had one of those tour buses equipped with video screens and a DVD player, and my friend Dave Cotnoir, a French Canadian, had a copy of this DVD with him. Apparently, "Le Peuple Migrateur" received a lot of positive attention from film critics and foreign film buffs a couple of years ago. It was a limited theatrical release in America. Somehow I totally missed it. Too bad. This one would have definitely been worth seeing on the large screen. The film is visually stunning from the very first frame. The cinematography is more breathtaking than anything I have ever seen (and that includes the IMAX scenes filmed on Everest). The best parts feature close-ups of birds in flight from angles you could scarcely imagine possible. At first I thought this was just a remarkable example of computer-generated special effects. Then I thought the filmmakers must have somehow filmed birds in a wind tunnel and used blue-screen effects to superimpose them on scenery. But soon I realized they must have somehow literally filmed from within a flock of flying birds. I briefly considered the possibility that they might have developed a digital camera small enough to strap to a bird. But the camera motion was too perfect for that. Fortunately, there's a special featurette with the DVD that shows you how they did it. In some ways it's even better than the actual film. The "making of" documentary reveals how filmmakers raised hatchling flocks of several kinds of birds (snow geese, cranes, and others), "imprinted" them with the idea that the filmmakers were their parents, taught them to fly alongside ultralight aircraft, and then filmed them in flight at spectacularly close range. The film is a remarkable achievement. It's not a perfect film. There's almost no narration, so you won't learn many objective facts about avian migration. Most of the information given is conveyed in minimalist subtitles with next-to-nothing factoids like "The arctic tern migrates 12,500 miles from the Arctic to the Antarctic"; and "The Greater Sage Grouse lives in Idaho." That's disappointing, because I found myself constantly wanting to know more about the birds I was seeing. There's also no plot to speak of, and some of the flight scenes in the middle are so long that if I weren't part of a captive audience on a bus, it might have lost me about halfway through. But at the very point where I began to be aware of a sense of boredom, something happened to capture my attention again. At the end, I was enjoying it so much that I was sorry to see the credits roll. The soundtrack is almost as beautiful as the film itself. The film took more than three years' to make, with a crew of 450 people, in numerous locations spanning all the continents. It literally offers a birds-eye view of the whole earth. It was all shot on 35mm film. Each cannister of film lasts only four minutes, and a lot of the scenes required hours of filming while waiting for something to happen. This was surely an expensive film to make, but well worth the effort and expense. The filmmakers had no agenda to demonstrate the glory of God. As far as I know, they are as atheistic as any French scientist. But in an amazing way, they have accidentally documented the grandeur and power of an all-wise Creatornot to mention His love of beauty, diversity, and order. HT: Red State and Reformed at "Random Responses"
Here's an incomplete list of some recent links back to PyroManiac. I didn't have a lot of time to assemble a longer list. If I get an opportunity, I'll do more BlogSpotting soon. Oops. I must have backed my sweet ride over someone's toes. Although I have never "call[ed] social action in politics" a fad, I did indeed post a list of fads that included James Dobson's ecumenical style of culture warfare (wherein political campaigns for moral reform are divorced from any clear presentation of the gospel). I also explained why I think Dobson's strategy qualifies as a fad. But the anonymous guy in a gorilla mask over at "Christian Survey" evidently found my remark about Dobson "pejorative and not useful." Lumping me with the "whine faction" is also pejorative, of course. But apparently that's "useful." Char Moore does her best Navin Johnson imitation. She's amazed and amused at how you people who read PyroManiac can find things to fight about, even when I post non-controversial stuff. Bet at "Dappled Things" thinks I'm too loud. Paul Martin finds a useful link and borrows it. He also appreciated my review of Michael Haykin's book. Clint Humfrey liked my book reviews. He has perhaps the only cowboy-themed theological blog in the blogosphere. Ian Clary likewise was happy to see Michael Haykin's book receive due recognition. Ian's blog has to be one of the few finshing-themed theological blogs out there. Rob Wilkerson wins the coveted Warnie. Inkling at "The Rough Woodsman" ponders the mystery of how to get listed on my blogroll. He seems to know intuitively, however, that he cannot post a link to me without getting BlogSpotted. His post reminds me that I need to do a post explaining my blogroll policy. And I also need to update my blogroll. The aptly-named Pecadillo launches his blog with some intriguing thoughts about handshakes and John Tesh. Remember how I spent most of Wednesday on a bus? Well, I spent most of Thursday on a train. It was scenic, and mostly relaxing, and this time I read books rather than Internet printouts. Secret Radio, by Grace Jovian. I don't think it's supposed to be any big secret that "Grace Jovian" is a pseudonym for Jeri Massi, who occasionally comments here at PyroManiac and more frequently harasses me from the safety of her own blog. As I have said before, I don't read much fiction, but this is the second of Jeri's books I have reviewed. (Actually this is the third, if you count the two volumes of Valkyries separately.) Her stories are filled with characters, situations, and angst that will all be instantly familiar to nearly anyone who has attended a fundamentalist school. Secret Radio is a story Jeri originally blogged, and it therefore has a serialized feel. One suspects there are major doses of autobiographical non-fiction blended in. It's poignant, occasionally funny, and even painful at times. To be honest, I liked Valkyries better, but Secret Radio is engaging, entertaining, thought-provoking, and well written. Anyway, Defense of the Truth is a survey of six key controversies from several diverse eras in church history. Haykin shows why these controversies (and especially the polemical fortitude of the key figures who fought for the truth) are instructive for us today. I once did a similar project: a series of lectures on five major heresies that (at one point or another in church history) threatened the very life of the church. My lectures were translated into Italian and published, but I haven't done the book in English yet. Naturally, I was curious to see how Haykin's book was written, what topics he focused on, and whether any of his material intersected with my subject matter. Of Haykin's six chapters, only one corresponds to any of my five major heresies, and that is his chapter on Athanasius and the Arian controversy. My material focused a little more on the debate leading up to the Nicene Council; Haykin gives much more detail about the conflict that came after the council. It is an utterly fascinating and supremely important chapter in church history. Thank God for the courage and persistence of Athanasius. Every chapter in Haykin's book is a profitable read. My favorites were the excellent chapters about Irenaeus and gnosticism, Augustine and church history, and St. Patrick and missions. I loved the book. In a generation when Christians seem to think everything novel is automatically better, it is refreshing to read the work of someone who knows and appreciates the history of doctrine and who knows and cares about where the church has already been. I hope Haykin lives long and keeps writing. The Wages of Spin, By Carl R. Trueman. My first encounter with Trueman was on the Web, through his excellent critique of the historical ham-handedness of Sanders, Dunn, and Wright. He struck me as clever, perceptive, witty, and a good writer. The Wages of Spin proves he is all of these. The book is a collection of Trueman's essays on various subjects, starting with one I'll bet Michael Haykin would give a hearty amen toand I know I would: "Reckoning with the Past in an Anti-Historical Age." Trueman offers a spot-on analysis of the fallout from the modern and post-modern tendency to be militantly anti-historical. The effect of this trend on evangelicalism has been particularly destructive. Our Protestant and evangelical distrust of "tradition" has subtly morphed into a contempt for history, and the effect has been disastrous on a number of levels. This one factor has explains popular evangelicalism's doctrinal illiteracy. It also explains why in our worship, virtually everything novel is immediately embraced by evangelicals, while virtually everything that pertains to our rich spiritual heritage has been unceremoniously abandoned. There are lots of great essays in the bookespecially "The Undoing of the Reformation?" and "The Glory of Christ: B. B. Warfield on Jesus of Nazareth." But my favorite section is at the end: "Short, Sharp Shocks." The shortest of these mini-essays would make wonderful (albeit longish) blog entries. The clever titles ("The Marcions Have Landed! "; "Boring Ourselves to Life") reflect the wittiness of Trueman's writing style. Hats off to Carl Trueman for this volume. He constantly provoked me to think while making me smile. I love that kind of book. Back on the bus tomorrow. I'm already reading another book I promised to review for Challies. If he hasn't given up on me. Darlene and I are on a three-day trip to somewhere-and-back with a busload of people we love. It was more or less a last-minute decision to go on this trip, and I apologize for the interruption in what was supposed to be a series on "New-Model Evangelicalism." I'll get back to that ASAP after my return. I'd say where we are and whom we're with, but in these days of heightened security alerts, discretion is the better part of valour. Besides, I noticed that the hydra known as C.T. is back to harassing people, and I don't want to risk having him/her/they/it hunt me down and slash the bus tyres. Anyway, I plan to give a full report on the trip with some pictures sometime after I get home. Stay tuned. As I have mentioned before, it is my practice when I travel to take as much reading material as I can carry. Since this trip is by bus rather than by plane, I could carry more. So I have brought one briefcase full of stuff that I've printed out from various blogs and websites, and a second briefcase full of books. I am continuing to slog my way through McLaren and Raschke, left hand raised high so I won't get any on my watch. And I have come to the settled conclusion that postmodernism is dead. Why do I think this? What is the evidence? The proof is conclusivewe can tell that postmodernism is dead because contemporary evangelicals have started to embrace it. The party ceases to be cool when the nerd shows up. No time to write more at the moment. I'll try to post again either late tonight or early tomorrow. I'll be out of town through Friday night. If I have any connectivity along the way, I'll try to blog, but no promises. Christian sports blogger Tim Ellsworth chronicles his day at Wrigley and seizes the opportunity to act likewell, a Cardinals fan. From today's New York Times. No further comment necessary. In the autumn of 1979, I was assistant pastor and minister of youth at Central Bible Church in St. Petersburg, FL. Darlene was in the third trimester of her first pregnancy. The Iranian hostage crisis was the lead story on the evening news every night. Rubik's Cubes were all the rage. I don't remember who gave me my first Rubik's Cube. If I recall correctly, a Cube cost about $6.95and in 1979, that was real money to a youth pastor about to become a parent for the first time. So I don't remember buying it for myself. It must have been a gift. If so, it was the perfect gift for me. I love tactile puzzles, and this was the greatest puzzle of all time. The problem with a Rubik's Cube is that it's really simple to work, simple to move, simple to mess upbut not so simple to solve. When I started playing with the Cube, I thought it might take me an evening to solve. By the end of the first evening, I knew it would take at least two full evenings. After three days, I thought perhaps the thing was unsolvable. But I couldn't put it down. My problem at first was that I assumed if I kept moving the Cube randomly, the pieces would eventually fall into place. After all, how many possible positions could the Cube pieces be arranged in? Answer: about 43 quintillion. (43,252,003,274,489,856,000, to be exact.) And all of them but one are wrong. In the end, it took me a month to solve the Cube. After I solved it once, it took me three days to do it a second time. But once I began to figure out what each complex move did, I was able to solve the Cube from any random position in five minutes or less. That's nothing. Lots of speed-Cubers can solve any Cube in less than a minute. I once saw a guy who could solve a Cube in three minutes or less, using only his feet. There are several different methods of solving the Cube. Most of the printed cheat-sheet instructions show you how to solve it a layer at a time, like a three-layer cake. My preferred method is to get all the corners in place first and then move the center edge pieces into place. There are now 4x4 and 5x5 Cubes. I once figured out how to solve a 4x4 Cube. I have never attempted the 5x5. The Rubik's Cube is now more than a quarter-century old, and I read somewhere that one of every eight people in the world has attempted the puzzle. I still keep several Cubes on my desk, and I just got the 25th-anniversary edition, plus a 5x5 Cube. When I quit blogging and have time, maybe I'll learn to solve the 5x5. 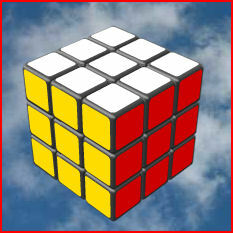 Work the Cube online at Rubik's official website. The simplest of all solutions. If you've never mastered the Rubik's Cube, I dare you to try. If you can already solve a Rubik's Cube without instructions, leave a comment and tell me your preferred method (corners first, edges first, a layer at a time, or whatever). In 25 years since I first encountered the cube, I have met only one other person who learned to solve it on his own, without reading any instructions. For me, it was a valuable exercise, because I learned something about patience, persistence, and even logic. One of the things you quickly learn is that you can't move one piece without affecting at least one other piece. And most moves displace at least three pieces. It's a three-dimensional object lesson about the inevitability of causes and effects, as well as an effective illustration of the principle of 1 Corinthians 12:25-25: any body composed of multiple members is still one body, and whatever effects one member affects the whole body. PS: On the way to work this morning, I was thinking about another important and rather obvious truth that is well illustrated by the Cube. With 43 quintillion possible arrangements, you are not going to solve the Cube by accident. No one ever has. If the complexity of a six-sided cube with 26 inert plastic pieces is enough to rule out an accidental ordered solution, how could any rational person imagine a scenario where the whole universe, with all its vast complexity and order, could have come into existence by accident, apart from an intelligent Designer? Carla Rolfe ponders how to respond to an influential "Christian apologist" who claims universalism is perfectly compatible with the fundamental truths of Christianity. The guy acknowledges that universalism is unbiblical. But he insists it's an error that doesn't impinge on any essential doctrine of Christianity. Therefore, he says, it's a "difference of opinion" that ought to be tolerated within the circle of our Christian fellowship. I agree with the concerns Carla has raised. Universalism is a denial that God must be feared and believed by those who will be saved, and that absolutely is the most arrogant sort of repudiation of one of the first and most fundamental teachings of Scripture: "Without faith it is impossible to please Him, for he who comes to God must believe that He is, and that He is a rewarder of those who diligently seek Him" (Hebrews 11:6). The error Carla has highlighted illustrates once again the folly of thinking the fundamental doctrines of Christianity can be reduced to a short list of five. For those with a craving for more controversy about politics and evangelical priorities, mosey over to Triablogue (still one of my very favorite blogs), where Jonathan Felt, AKA Jus Divinum, has kept up his nattering critique of my position on the church and politics. Jus Divinum followed up his "Neo-Pietism or Ostrich Evangelicalism" with "Ostrich Evangelicalism, Indeed," another very long screed in response to my post last Saturday ("Roast PyroManiac au Jus"). In that post a week ago, I made a slightly derogatory reference to the long-windedness of JD's fulminations against my views on political activism. Apparently, the fact that I even noticed actually encouraged him to step it up. He called my previous responses to him a "perfunctory brush-off" and threatened to reveal that I am guilty of promoting "Popcorn piety and drive-thru-sanctity" if I didn't cut out the snide remarks about the verbosity of his posts. I responded to his second "Ostrich Evangelicalism" post with a brief summary of why so many of his arguments have missed the mark, leaving me less than passionate about answering his logorrhoea line for line. JD responded with "a fairly short reply" in the same comment thread. Then he added "Further Comments on the ECB Dispute," where for one brief shining moment, he seemed to catch a glimpse of the fact that my position might not quite be precisely what he had been arguing against. Perhaps I ought to have let the issue lie there, but JD replied with yet another analysis of the post I made last Saturday here at PyroManiac. In his reply this time, "Slippery Slopes and the Genetic Fallacy," he suggested that my use of the term ecumenism is ambiguous. He proposed two possible meanings, and cited John Frame against the "Slippery Slope" fallacy. In retrospect, that would have been a good place to let him have the final word. Instead, I replied with a short comment clarifying what I mean by "ecumenism," and answering one of his commenters who seemed to caricature my position as the fear that "if a believer gets involved in any type of political activism, that they will consequently drop their faith like a dirty shirt." In my comment, I spelled out once againthis time in a four-point listwhat my real concerns are. After a relatively long period (a day and a half) of silence on the issue, JD came back with "Scattered Replies," in which he replied, among other things, to my two previous comments. Meanwhile, the ever-imposing Steve Hays, who had been mostly silent through all of this, weighed in with a severe scolding against those who "are whining about the word-count of what JD and [Steve] write." His ire was directed in particular against "someone who raises objections, and then blows off anyone who addresses the objections he himself has raised." I'm pretty sure I have been the chief "whiner," so I couldn't resist a comment or two in self-defense. 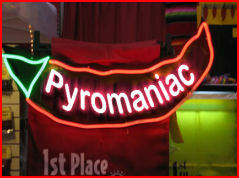 Steve replied that the "someone" to whom he referred was not the PyroManiac. At this point, I threw up my hands, caved in, and replied line by line to JD's tirade. Then I replied in similar detail to the first half of his "Scattered Replies" post. I'm inclined at this point to let JD have the final word, no matter what. I don't have endless reservoirs of spare time for that sort of drawn-out disputation. But I reserve the right to pull a Bill O'Reilly and try to get the last word in anywayespecially if JD falls back on a caricature of what I believe rather than responding to what I have actually said. We'll see. I wholeheartedly agree that dismissive labels are not valid substitutes for sound arguments, and I do try to write accordingly. On the other hand, labels can be valid shorthand in cases where the supportive argumentation is already well established. The postmodern antipathy for any and all labels is patently unreasonable. If a Jehovah's Witness comes to my door claiming that Jesus isn't eternally God but the highest of all created beings and a kind of "god," it is perfectly appropriate for me to label his view Arianism and refer him to the lessons of historical theology for an answer to his heresy. Magnanimity doesn't oblige me to seriously consider his error anew just because he himself doesn't call it "Arianism." To the degree that today's Open Theists have espoused Socinian or neo-Socinian notions, it is perfectly legitimate to label their ideas accordingly. In some cases, those ideas deserve to be dismissed with extreme prejudice. If someone seriously does not understand why Socinian tendencies have always been destructive to the church, or why a particular tenet of Socinianism is wrong, or why in the world anyone would label some of the postmodern ideas about the atonement "neo-Socinianism"just ask, and I will be happy to try to explain why I have employed a certain label, show why the error I've applied the label to is a dangerous idea, or otherwise make whatever argument you feel has been missed. But if there is a new postmodern rule about "politeness" that in effect forbids us from ever pointing out that certain aberrant theological notions have already been decisively consigned to the dustbin of heterodoxy by the unanimous consensus of Protestant and evangelical history, I did not get that memo. And if we're now required by the manners-police to drop all our prior objections to serious errors like Pelagianism, eschew all labels, and give serious consideration to every new denial of Original Sinjust because the architects of post-modern theological folly want to call their views something other than "Pelagianism"then I'm warning you right now: you're not going to think I'm playing nice. New-model Christianity, or old-model heresy?